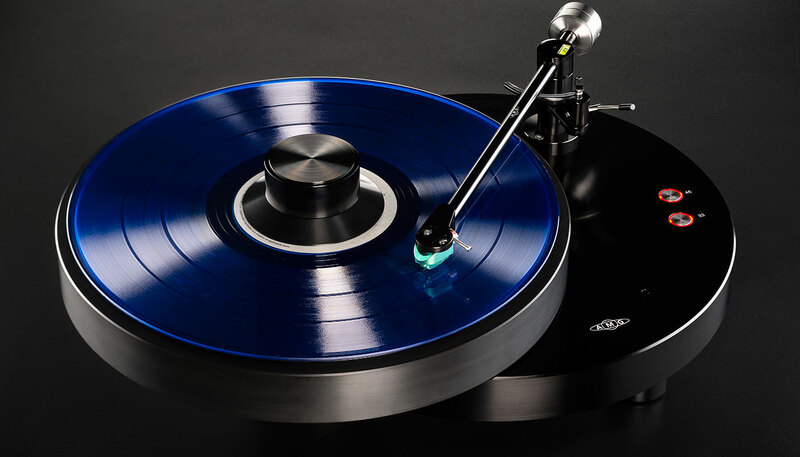 In August of 2012, I reviewed the AMG Viella V12 Turntable and V12 Tonearm. After the addition of the HRS platform, I purchase this combination. Before that, I had owned the Shindo turntable and since then I have reviewed the Artisan Fidelity Garrard Statement, the wonderful little Tri-Art Audio Pebbles TA-1, the highly innovative Thales TTT-Slim, the TriangleART Symphony, and Symphony SE. There were some exceptional turntables in that group, especially the Artisan Fidelity Garrard Statement and the Thales TTT-Slim, but I still own the AMG V12 combo. I think this is a pretty ambitious undertaking for AMG. The AMG V12 at $16,000 without the wood skirt plus the addition of the custom-made, $3,495 HRS platform plays in a field of turntables and arms that cost so much more that its combined cost of $19,495. I’ve found no combo that can do everything as well and I’ve tried listening to turntables that cost more than three times as much. So, I thought they already made the best bargain in high-end turntables and arms. I just wondered what AMG could offer in a table that costs $10,000. The problem I saw was that $10,000 was still much more than the average person can spend on a turntable. This leaves us with the question, is there a market for people who will spend $10,000 but not $15,000. Well, that’s not my problem and I hope there is, for this is surely a great turntable for $10,000. This combo was around $6,000 less expensive than the V12 without a wooden skirt. The only turntable on the list of turntables I’ve reviewed lately that cost less with their own tonearm is the little Art Audio Pebbles. So, it is with great anticipation that I come to see how close AMG can get you to a V12 for around $10,000. The Giro, like my V12, is entirely manufactured in AMG’s Bavarian factory. I think it is accurate to say the Giro is a scaled down version of the V12. Like the Viella, the Giro is a non-suspended table so it will benefit from being placed on something like the HRS base made for the Viella or at least a heavy piece of granite or slate. Both the platter and bearing housing are CNC machined from POM, a high tech synthetic, with the same special manufacturing process of the V12 for greater precision, cost-effectiveness, and high finish quality. The Giro’s circular plinth is machined from aircraft-grade aluminum and provides both 33 and 45 RPM via an electronic control. It shares the same high-mass stainless steel machined pulley of the V12, coupled to a precision Swiss-made DC motor. The belt-driven platter features the single-piece construction and decoupled spindle design of the Viella turntable. The platter bearing is a hydrodynamically lubricated, radial 16mm axle with PFTE thrust pad and integral flywheel. It is a scaled version from the V12. The 9W2 9-inch tonearm shares the identical, revolutionary bearing design of the 12J2 but scaled for the shorter arm length and the Giro’s smaller footprint. This bearing is a dual-pivot design with the vertical bearing design being similar to that used in the rotor heads of helicopters. It uses two 0.5mm thick “spring steel wires” that allow the fine tuning of the azimuth while also eliminating any play in the bearing. The horizontal axle is hardened tool steel, precision ground to a backlash-free fit with a needle roller bearing. AMG claims it is extremely precise, maintenance free, and never requiring adjustment. 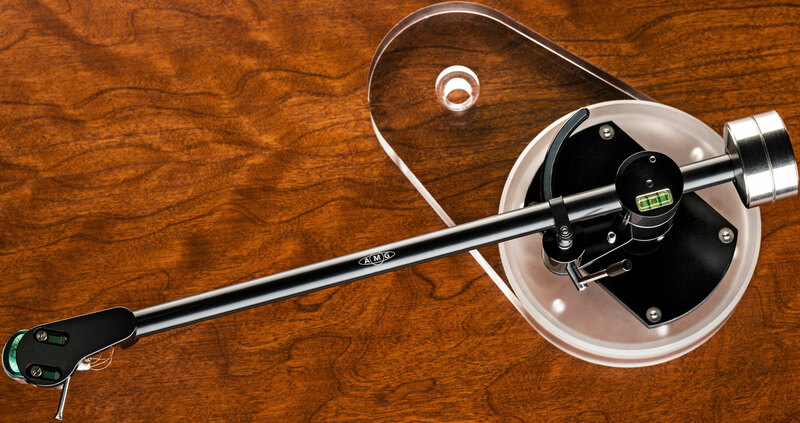 The tonearm wand is made of aircraft quality, anodized aluminum tube for resonance control. It is wired with three strands of 50 micron high-quality copper per leg. Anti-Skating is of the magnetic design with a decoupled ring magnet and two bar magnets. The magnetic fields are isolated in their patented bearing housing. VTA can be easily adjusted during play, but you will need to lock the arm after setting it. To make this even easier, there is a spirit bubble built into the top of the bearing cap. Not only is it scaled down in design; it is also scaled down in size. I think the “double circle” plinth is a really neat looking design. Compared to the V12, the Artisan Fidelity or the TriangleArt tables I reviewed, the Giro seemed small, not as small as the Thales TTT-Slim but small. It was the arm that really seemed small to me since I’m used to a twelve-inch tonearm, and this is a nine-inch tonearm. Like the Thales arm, the Giro’s small and short tonearm tube just made it seem small to me. The fact that it’s small didn’t matter; it is still a very refined and eye catching turntable. Setting up a new turntable from scratch is often quite a chore. There’s the table itself to set up, then the tonearm, and finally the cartridge. Not the Giro, I set the table and the tonearm up in less than an hour, including unpacking. I think most of you like me will be shocked by how small the box for the Giro is but as you unpack it you will be impressed how well designed it is. You should take everything out and set it somewhere safe. Then, place the plinth on its shelf and run the tonearm wire through the small hole in the plinth. This is easier done before you mount the platter or the tonearm. This is also a good time to plug in the turntable. Next, you should pick up the platter and put the belt around the grove on the inside of the platter and place it on the pivot while you place the belt over the pulley. This is much easier than with the V12, but it still may take a couple of tries the first time you do this. It’s just a little daunting since like the V12 the pulley is under the platter. Because of the weight of the platter, it is much easier to do on the Giro. Now you should level the turntable; there are two small holes in the plinth. One hole is on the back behind the platter the other is on the left in front of the platter. In the tonearm box are all the tools you need. You take the number 3 driver and place it in the holes to adjust the level. I think this is easier to do before the tonearm is mounted on the plinth. Now it’s time to mount the tonearm and align the cartridges. Since the hole is predrilled and you should already have the phono cable with the straight DIN plug coming through the hole, all you have to do is carefully plug in the phono cable. Put the counterweight on the tonearm and then place the tonearm pillar in the mounting collar and orientate it so that it’s just slightly pass the power buttons. You need room to touch the buttons, but don’t put it much further toward the platter because of the magnetic anti-skating. Now it’s time to get the cartridge mounted and setup. I started by getting the tracking force close to 1.5 grams; it’s not critical yet. Then I checked to see if the bubble level in the tonearm pillar to see if it was level. This adjustment is done by using the #1.5 driver to unlock the collar and adjust the VTA screw until the bubble is dead level. Then you need to lock the collar back as described above. Now, use a protractor, I used the Clearaudio one, to get the cartridge set up and the set the tracking force to 1.5g. Again, all this is very straightforward and takes very little time to do. I made no other changes to my reference system than swapping the two AMG turntables for one another. The reference system consist of a pair of Teresonic Ingenium XR Silver speakers, a Pass Labs XA30.8 amp, an Emia Remote Autoformer Volume Control, cables by High Fidelity Cables, and the turntable was set on the same HRS platform as I use for the AMG V12.